Does Elektron’s update to its popular synth have what it takes in an increasingly crowded market? A decent sonic and functional update. Despite reservations regarding polyphony and the price, this is solid piece of gear. Excellent connectivity options - USB (including audio via Overbridge), MIDI, DIN Sync, CV/Gate and analogue audio in/out are all here. More dedicated buttons make for quicker workflow. The OLED screen is a great improvement on the MkI, but a larger, hi-res one might have been even more welcome. 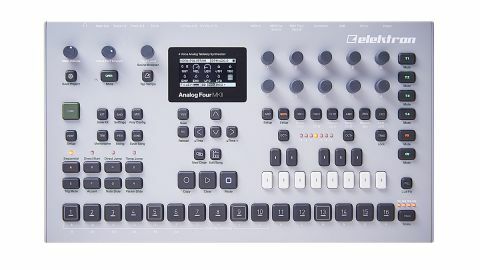 Elektron has been in the music technology game for some time now, and have recently introduced the second iterations of a number of products. The Analog Four MkII has a range of reworked elements across the design, though at its core the unit remains a self-contained sequencer linked to a four-voice analogue synth section. Sporting a new grey livery and cast aluminium case, the most noticeable change is the move to a larger number of rectangular backlit buttons and clearer OLED display, which bodes well for usability. Before we look at the sequencing capabilities of the AF2, lets dive into its sonic architecture. Each of its four voices is based around a strong dual-oscillator subtractive sound engine. The oscillators are analogue, with filtering and overdrive also taking place in the analogue realm. However, the noise, envelopes and LFO are digitally generated. Some people balk at this kind of thing, and much of the sniffiness stems from the days when digital control made for slow or quantised modulation sources, but on a modern piece of kit it allows for more controllable results. This means that the path from oscillator to output is entirely analogue. (The digital effects section is parallel to the main audio path, with send/return elements mixed in the analogue realm). The core settings of each oscillator are broadly the same, with each getting a choice of four waves: Sawtooth, Pulse (square), Transistor Pulse and Triangle. The interesting bit here is that as well the two tonally different pulse shapes, the Pulse Width parameter reshapes all waves in a range of interesting ways. The dedicated PWM LFO allows this to be modulated to add thickness or tonal interest. It’s also possible to employ either of the external inputs as an oscillator source, with Oscillator 1 adding a filter feedback option, and Osc 2 offering filter output passthrough (‘Neighbour’ routing) between voices/tracks. Each oscillator also includes a flexible square wave sub-oscillator (at one or two octaves below, or a fifth above, and in varying pulse widths). It’s a shame there’s no dedicated sub level control, as it can require taming on some sounds. In many ways, the Analogue Four MKII combines the best of digital and analogue in the same box. The independent analogue sound engines make it pretty straightforward to provide independent outputs for each voice. Elektron also enhances its usefulness as a sound processing box by including two analogue inputs. Despite its decidedly 21st century sequencer, the AF2’s credentials in the analogue control department are also second to none. On the rear you’ll find four CV/Gate outputs that can be configured to control parameters on external synths or generate pitch and trigger signals. Secondary pages allow you to add two-way amplitude modulation, oscillator sync, pitch sliding (auto bending) and dial-in a vibrato LFO. We particularly liked the Noise section on the AF2, which has variable noise colour, ‘Sample & Hold’ (for great old-school computing effects) and adjustable fade-in/out. Another neat parameter is ‘Detune’, which offsets frequency by a set number of Hertz, and allows controlled beat-frequencies to be dialled up - something we also found useful on the Moog Sub 37. The filter section is also more detailed than many other modern analogues, being more akin to something you’d find on a software instrument. There are two filters on the AF2. The first is a decent- sounding 4-pole (24dB/oct) low-pass filter with an overdrive section and cutoff modulation linked to its own envelope. Audio then passes through a 2-pole multimode section (with seven selectable flavours) that is also hardwired to the Filter Envelope via it’s own depth control. Compared to Filter 1, Filter 2 has more uniform resonance behaviour across the audio spectrum. Neither filter can be entirely bypassed, but there are suitable settings to minimise impact. The Amp Envelope is one area where digitally controlled modulation provides greater scope for tweaking. In this section, you set the send level for chorus, delay and reverb. The next envelope page takes care of the filter envelope (with additional destination routings) and a third one that can be allocated to control anything from a comprehensive modulation list. Two LFOs, with multiple trigger modes, complete the modulation line-up. The effects section is worth a mention, as it goes a little further than some competitors. The chorus offers plenty of control, the delay adds an overdrive section, whilst the reverb is capable of huge infinite decay washes as well as the more usual acoustic spaces. The sequencing aspects are well integrated with the sound engine, and allow the recording and playback of parameter tweaks as well as notes - though recorded movements are not reflected on-screen on playback. There are also ways of altering a parameter, or changing the sound, for each step in a pattern, and even advanced condition-based processing. For those used to software sequencing, the screen and secondary button presses may need getting used to, but if self-containment is your thing, this might be what you’ve been waiting for.